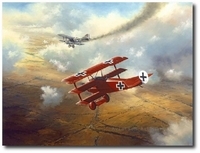 The artist, Russell Smith will apply your remarque of a Fokker DVII as seen here to the lower border of your print for an additional $25. Overall size: 28" x 14"
Image size: 24" x 9.5"
Jasta 15 had one of the most unusual histories of the Jasta squadrons. After assuming command of JGII in March, 1918, Hptm Rudolph Berthold tried to have his old unit, Jasta 18, attached to JGII. After failing to do so, he then arranged to have all of Jasta 18�s flying personnel swapped out with those of Jasta 15, a unit already attached to JGII. With them, the former pilots of Jasta 18 brought their unit�s colors � blue fuselages and red noses. Pictured from front to back are: Ltn d R Hugo Schafer, 11 victories; Ltn d R Josef Veltjens, 35 victories; Hptm Rudolph Berthold, 44 victories; Ltn Oliver von Beaulieu-Marconnay, 25 victories; Vzfw Gustav Klaudat, 6 victories. Printed on acid free rag paper, the edition consists of 250 prints, each of which is signed and numbered by Russell Smith.